This is a green design column by greenz. The topic for this month is how design competition’s are changing throughout the world. To convince someone “I want to participate in the competition!” it is initially important that there should be a presence of competition that takes a roll as “gateway competition for young designers” like Milan Salone Sattelite. Being contemporary is also an important element to attract designers of the right demographic. It might be obvious to look at the transition of design competitions. And what I feel recently is that there is a tendency addressing “change the world” seriously in the theme of competition. For example there is the Aspen Design Challenge, hosted by AIGA, the largest design community in the US. AIGA is an association like JAGDA in Japan, but they’re also building a Center for Sustainable Design, a resource for sustainable design information and they actively cooperate with Designers Accord, which is also called the “Kyoto Protocol for design”. Cooperating together with the NGO Circle of Blue, the network of journalists and researchers who are addressing the water crisis, AIGA in Aspen Design Challenge calls for ideas, around the theme “Designing Water’s Future”, to students throughout the world and how we should use water resources, which raises concerns for another war as “the new oil”. What is so evolutionary about it is the selection criteria. You need to make a hypothesis, based on research and then think of an effective strategy. It is specified that they will place more emphasis on “creative thinking”. And communication design – how you communicate the idea – is also important. Since water relates to all aspects of your life, the water crisis needs to be approached from multiple angles. This is a competition that is open to all students from any school. If you don’t know how to find design competitions, a design portal site, DEXIGNER is useful. I looked up several interesting competitions from DEXIGNER. From Europe PICNIC green challenge. The prize 500,000 EUR is amazing! They’ve already closed entries for this year. In September the winner will be announced in Amsterdam. The last year winner is Igor Kluin, who works at Qurrent where he has developed the distributed generation router called Local Energy Network. They have also developed packaged software, which allows you to browse the usage of electricity in a smart way, and it has already shown us a dreamlike worldwide energy web. I can’t wait to know this year’s winner’s positive ideas for the future. Next one is from the US. 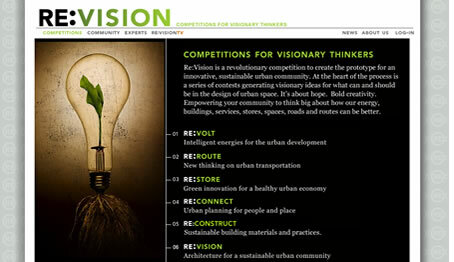 You should check out Re:VISION, a community site regarding landscape design. For “competitions for visionary thinkers”, there gathered many innovative designs that support new values. Another attractive point is jury members including well-known architects and designers, Paul Hawken, known as entrepreneur and visionary, Anthony Gilmore, a president at Whole Foods Market, etc. There are some easy-to-participate competitions like Design21, a participatory community for social design. They continually call for entries for various social competitions such as calling for film works to promote Millennium Development Goals and shelter designs used in natural disaster. Online discussions as well are available. You may want to keep eyes on the new way of how competitions will be held. Competitions gather many practical solutions. It is important for competitions to provide quick effects and feasibility, but at the same time it is essential that there is a crossing vision, even if the proposal is unrealistic utilizing current techniques. Creators and viewers should be ready to implement long term visions to solve problems that are 10 years out. What can design do to change the world? There might be a hint in the new design competitions.